April 4, 2008--Anna Janney DeArmond, 98, died on March 26 at Methodist Country House in Greenville, Del. Dr. DeArmond was a trail blazer during her 41 year career (1934-75) at the University of Delaware--she was the first woman to become a full professor, the first professor to receive UD's Excellence in Teaching award (she received it twice, in 1954 and 1972) and the first UD faculty member to be awarded the Medal of Distinction. The University also awarded her an honorary Doctor of Humane Letters degree. She also was among the first to teach a women's studies course and was a founding member of Phi Beta Kappa at UD. Among her other honors, Dr. DeArmond received the Joseph P. del Tufo Award for Distinguished Service to the Humanities from the Delaware Humanities Forum in 2000. She also received recognition from the American Association of University Women and the Delaware Commission for Women, which inducted her into the Hall of Fame of Delaware Women. Dr. DeArmond's teaching career took her around the world. 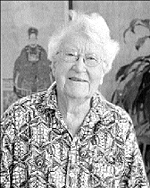 She was a Fulbright lecturer at the University of Munich in 1956-57, a visiting lecturer at the University of Sheffield in England and a visiting professor at the University of New England in Australia and Qingdao Ocean University in China. She also taught at other U.S. colleges. After retirement, Dr. DeArmond enjoyed teaching at UD's Academy of Lifelong Learning. A graduate of Swarthmore College, Dr. DeArmond received her master's degree from Columbia University and her doctorate from the University of Pennsylvania. Dr. DeArmond is survived by her brother, James Keyser DeArmond of Exton, Pa.; a niece, Margery DeArmond Maconachy, and her husband James of Coupeville, Wash.; and a grandnephew, Randall Stevens Maconachy of Fukuoka, Japan. A memorial service will be held at 1 p.m., April 8, at Cokesbury Village, 726 Loveville Rd. Hockessin, Del. In lieu of flowers, the family suggests contributions to Compassionate Care Hospice, 5610 Kirkwood Highway, Wilmington, DE 19808.